Distribution: They tend to be common in the intertidal zones and tropical and subtropical reefs around the world. Typically solitary sea creatures spend most of their time hiding in rock formations or burrowing intricate passageways in the sea-bed. .Ecology: Unlike most crustaceans the mantis shrimp actually hunts, chases and kills it living prey. They rarely exit their homes except to feed and relocate, and can be diurnal or nocturnal depending on the species. The grouping of mantis shrimp into spearers and smashers is based on two variations in the predatory claws . The Spearers armed with spiny appendages topped with barbed tips, used to stab and snag prey whilst the Smashers, possessing a much more developed club used to bludgeon and smash their meals apart. The "punch" delivered has roughly the acceleration of a .22 caliber bullet. Both types strike by rapidly unfolding and swinging their raptorial claws at the prey, and are capable of inflicting serious damage on victims significantly greater in size than themselves. Smashers use this ability to attack snails, crabs, molluscs and rock oysters; their blunt clubs enabling them to crack the shells of their prey into pieces. Spearers, on the other hand, prefer the meat of softer animals, like fish, which their barbed claws can more easily slice and snag. 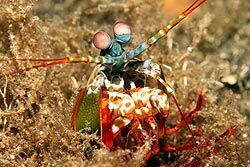 Interesting facts: Mantis shrimp have colour vision, Their eyes mounted on mobile stalks and constantly moving about independently of each other and are considered to be the most complex eyes in the animal kingdom. The eye design makes it possible for mantis shrimp to see bjects with three different parts of the same eye. In other words, each individual eye possesses trinocular vision and depth perception. The eyes of mantis shrimp may make them able to recognize different types of coral, prey species (which are often transparent or semi-transparent), or predators, such as barracuda, which have shimmering scales. Alternatively, the manner in which mantis shrimp hunt (very rapid movements of the claws) may require very accurate ranging information, which would require accurate depth perception. During mating rituals, mantis shrimp actively fluoresce, and the wavelength of this fluorescence was shown to match the wavelengths detected by their eye pigments . Females are only fertile during certain phases of the tidal cycle; the ability to perceive the phase of the moon may therefore help prevent wasted mating efforts. It may also give mantis shrimp information about the size of the tide, which is important for species living in shallow water near the shore. 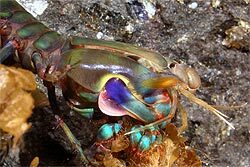 Mantis shrimp appear to be highly intelligent, are long-lived and exhibit complex behaviour, such as ritualised fighting. In a lifetime, they can have as many as 20 or 30 breeding episodes. In the monogamous species, the mantis shrimp remain with the same partner for up to 20 years.